It was a frigid start to the week for Torontonians on Monday as bitterly cold temperatures hung on in the city. According to Environment Canada, the temperature at Pearson International Airport at 7 a.m. was -21 C, but felt closer to -34 with the wind chill. The temperature in the region is slowly expected to rise to around -12 C, feeling closer to -20, later today. The cold has prompted multiple school boards, including the Toronto District School Board and the Toronto Catholic District School Board, to cancel buses today. Weather-related delays were also reported on GO Transit and on the TTC during the morning rush hour. "We had some issues with trains at the Wilson Yard, getting the trains out early," TTC spokesperson Stuart Green told CP24 Monday. "The switches get frozen. In conditions like this, when you have a lot of blowing and drifting snow that happens up at Wilson, the switches get stuck and the heaters just aren’t effective in this weather." He added that this morning the TTC only put the new streetcars into service and had buses supplement service. "The old streetcars just don’t like this weather," he said. He said crews will be out in full force to respond to any issues that arise during the Monday evening rush hour. "We’ve got extra crews coming in this afternoon, tonight, into tomorrow morning," he added. "So hopefully we can address any of those issues with the switches that we had for the subways. In the open cut areas of the subway where they are exposed to the elements, there is always a risk that these things can happen. But we are doing our best to get out there and fix them as quickly as we can." An extreme cold weather alert previously issued by Toronto’s medical officer of health remain in effect today. Environment Canada says the deep freeze is expected to continue overnight tonight. The temperature will feel close to -27 at around 4 a.m. but will ultimately warm up to a high of -4 C on Tuesday afternoon. 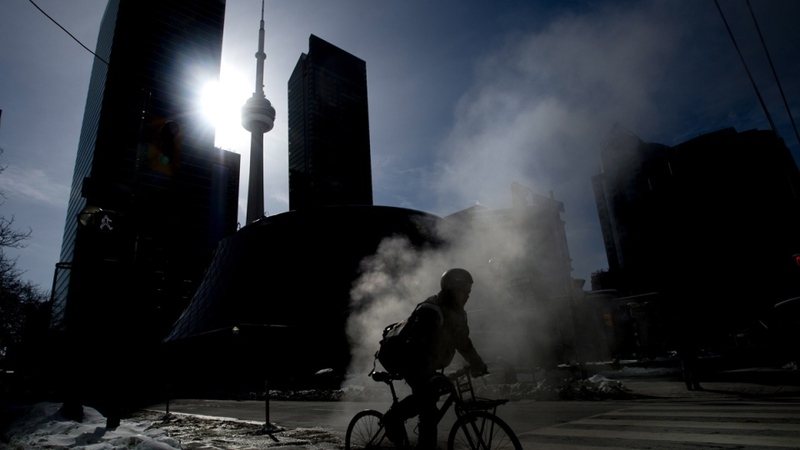 Residents in the city will get a break from the extreme cold on Wednesday, which has a forecasted high of 3 C.
Mary-Anne Bedard, a member of the city’s shelter, support, and housing administration, said as expected, Toronto shelters were busy on Sunday night and over the weekend. Speaking to reporters on Monday morning, Mayor John Tory confirmed that shelter capacity was sitting at around 96 per cent on Sunday night. “We continue to have service available. Our Streets to Homes staff are out on the street making sure they are connecting with people who are still outside and trying to encourage them to come in,” Bedard told CP24. For members of the public who want to help people experiencing homelessness in Toronto, Bedard said clothing can be dropped off at local shelters. Thestaff distributes theclothes to people in need. She said the city is working to add more beds to the shelter system as quickly as possible. “Today we are opening a new shelter at Davenport and Dupont for women. In December we opened a new shelter for seniors up in north Etobicoke. It is part of the program sponsored by city council to build a 1,000 new shelter beds in the next couple of years,” Bedard said. Tory added that the city is also working to build more affordable housing to alleviate the pressure on the shelter system. Tory previously set a goal to build 40,000 new affordable housing units over 12 years. “I’m going to set a goal fairly soon for supportive housing as well because it is high time that we put the pressure on other governments and offer to be their partners in making sure that those with mental and addiction issues have places where they can receive the support they need so they don’t have to be on the street and so they don’t have to be in shelters,” Tory said.